Meet local wild animals with a special visit from Wildcare animal rescuers. Discover ancient redwood trees including a rare dawn redwood tree! Create a unique sculpture in the Nature Zone at Blake Gardens. Learn how all life on earth is interconnected and interdependent. Become entangled in food webs. Play the photosynthesis game and learn how plants produce food using the energy of the sun. Make and enjoy plant part tacos. Learn about the anatomy and physiology of flowers. Visit working beehives and discover the important pollinator role of bees and other insects. Become an environmentalist by using the Five Rs – Reduce, Reuse, Recycle, Rot and Refuse. Follow a special creek to discover a hidden waterfall. Study aquatic invertebrates and other fascinating animals that make the creek their home. Enjoy an exciting Treasure Hunt Hike and explore secret ponds and gardens. 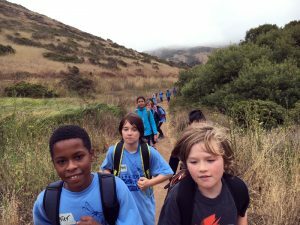 Embark on hiking challenges to experience areas of the East Bay off the beaten track. 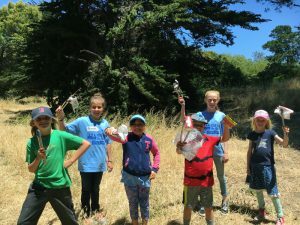 Campers will make a deeper connection with nature and learn to practice Leave No Trace ethics. 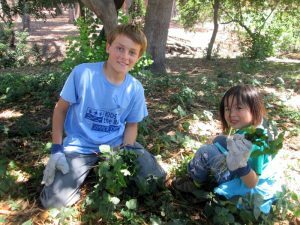 Campers will meet local wild animals in a special visit from Wildcare animal rescuers. Explorers will also enjoy a special evening Campfire Program and Twilight Hike, with dinner and s’mores.